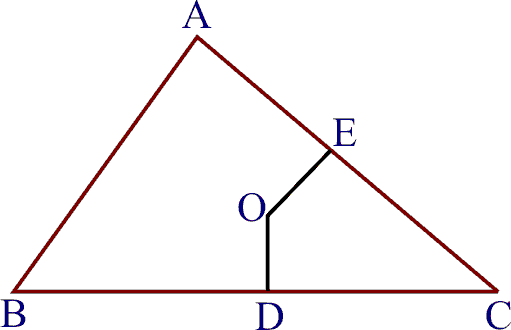 Q.1 ABC is a triangle. Locate a point in the interior of ABC which is equidistant from all the vertices of ABC. Let OD and OE be the perpendicular bisectors of sides BC and CA of ABC. 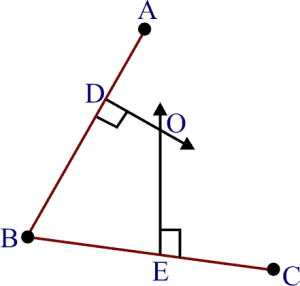 Therefore O is equidistant from two ends B and C of line- segment BC as O lies on the perpendicular bisector of BC. Similarly, O is equidistant from C and A. Thus , the point of intersection O of the perpendicular bisectors of sides BC, CA and AB is the required point which is equidistant from vertices A,B,C of ABC. 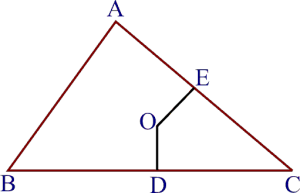 Q.2 In a triangle locate a point in its interior which is equidistant from all the sides of the triangle. Let BE and CF be the bisectors of and respectively intersecting AC and AB at E and F respectively. 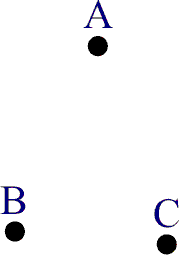 Since O lies on BE, the bisector of , hence O will be equidistant from AB and BC. Again O lies on the bisector CF of . Hence , O will be equidistant from BC and AC. Thus, O will be equidistant from AB, BC and CA. B : near which a man- made lake is situated. C : which is near to a large parking and exit. Where should an icecream parlour be set up so that maximum number of persons can approach it? 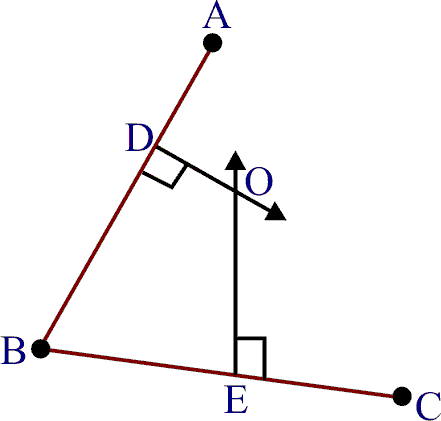 The parlour should be equidistant from A, B and C, for which the point of intersection of perpendicular bisector should be located. 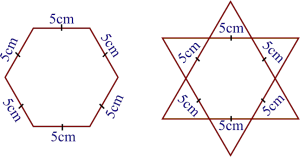 Thus O is the required point which is equidistant from A, B and C.
Q.4 Complete the hexagonal and star shaped Rangolies [see figure (i) and (ii)] by filling them with as many equilateral triangles of side 1 cm as you can. 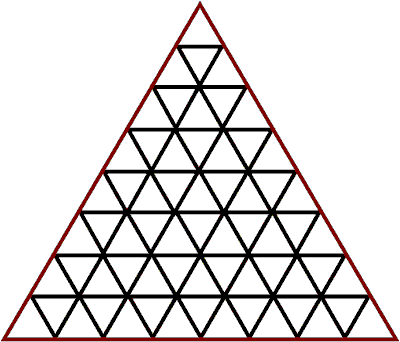 Count the number of triangles in each case. 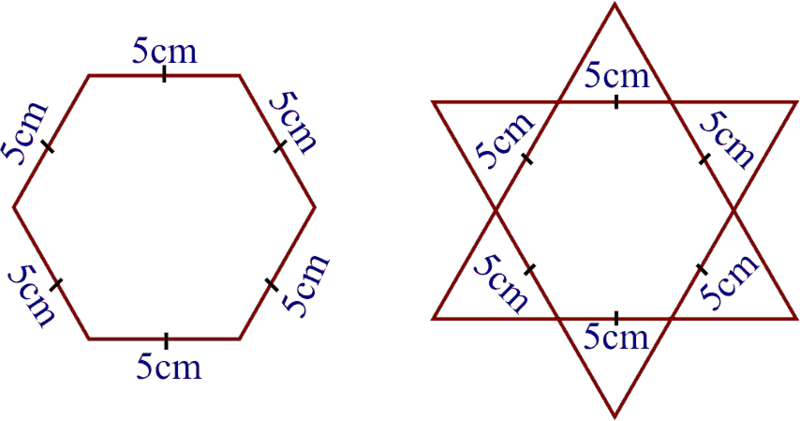 Which has more triangles? 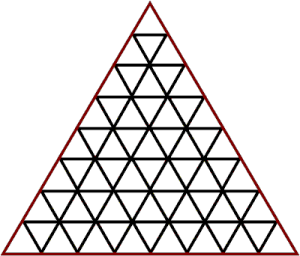 (i) number of such triangles is 150, and in figure (ii) number of such triangle is 300. 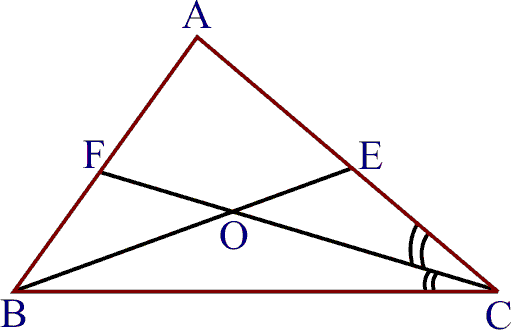 Figure (ii) has more triangles.